A New Pentacyclic Triterpenoid with Antimicrobial activity from the tubers of Cyperus rotundus Linn. 1. R. K. S. D. College of Pharmacy, Kaithal 136027 (Haryana, India). 2. Department of Pharmaceutical Sciences Guru Jambheshwar University of Science and Technology, Hisar, 125001 (Haryana, India). Plan: The present study is aimed to carry out a phytochemical investigation on Cyperus rotundus Linn tubers and to conduct antimicrobial assays of the isolated phytoconstituents. Methodology: The ethanolic extract of Cyperus rotundus tubers was prepared and used for the isolation of phytoconstituents. The structures of all the isolated compounds were elucidated on the basis of spectral data analysis such as IR, 1H‑NMR, 13C-NMR,Mass spectroscopy and chemical reactions. The isolated phytoconstituents were tested for antimicrobial activity against bacterial and fungal strains. Outcome: Phytochemical investigation of Cyperus rotundus tubers resulted in isolation of four phytoconstituents characterized as n-tritriacontan-16-one (1), Lup-12, 20(29)-dien-3β-ol-3-α-L-arabino furanosyl-2'-octadec-9"-eonate (2), n-pentadecanyl-9-octa decenoate (3) and n-tetradecanyl-n-octadec-9,12-dienoate (4). Only compound 2showed antimicrobial activity. 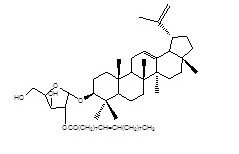 Lup-12, 20(29)-dien-3β-ol-3-α-L-arabinofuranosyl-2'-octadec-9"-eonate is anew phytoconstituent isolated for the first time from the plant source.Compound 1, 3 and 4 are reported first time from the Cyperus genus. Phytochemical investigation of tubers of Cyperus rotundus led to isolation of a new triterpenic constituent which may be used as chromatographic markers for quality control of the drugs. Ajay Pal Singh and Surendra Kumar Sharma A new pentacyclic triterpenoid with antimicrobial activity from the tubers of Cyperus rotundus Linn. Hygeia.J.D.Med 2015; 7(1):1-9. Available from http://www.hygeiajournal.com , Article ID-Hygeia.J.D.Med/138/15.